THE SHAKESPEARE BLOG – THE STRANGE CASE OF EDMUND SHAKESPEARE AND MR JONSON! One of the less succesful moments in the search through St Saviour’s records for Edmund Shakespeare, his immortal brother William and Southwark in general was when I stumbled on a payment in the London records “For Mr Jonson’s Book“. It came in an odd place though, namely the loose leaf records of Cure’s College, that little Southwark Alms house founded in 1588. You have to know the difficulty of reading those records, most especially deciphering variously spelled names, and gradually beginning to recognise them too, to understand why, as your eyes start to deteriorate or your pencil blunts in the London Metropolitan Archive, you can suddenly give into the tendency to convince yourself of a Eureka moment. The first and real Eureka moment was when I had linked the lease of that tavern where Edmund Shakespeare very probably died in December 1607, The Vine on Maid Lane, directly to a local Southwark fraternity granted Livery back in 1460, The Brotherhood of Our Lady of Assumption, and given rights by the King at Westminster, Henry VI, to buy local land of up to Sixty Marks. That was a true window on the history of the entire area because it established the significance of St Margaret’s Church, in the middle of Long Southwark and right opposite the Tabard. Which linked lay church life to the growth of London and commerce in general, in a very louche area, famous for the Bishops of Winchester licensing those ‘Winchester Geese’, for bear and bull-baiting and later for its theatres too. Peter Avergne and John Le Hunte were two of those livery wearing church wardens who invested in both The Vine and The Axe on Maid Lane, in a riverside district of perhaps 300 inns by Shakespeare’s day. John Le Hunte is clearly the direct ancestor of Edward Hunt, Esquire, who by Elizabeth’s reign owned sizeable land in Southwark called ‘Hunt’s Rents’ and bequeathed the Vine tavern to his pregnant wife Mary, also in 1588. His will is up on line. From there many discoveries arose, from the appearance of ‘pleyers’ working for the church back in the 15th Century and performing around St Margaret’s Cross, to the story of the rebel Jack Cade. Who marched from Blackheath and sacked the City in the real beginning of the Wars of the Roses, and fought the Battle of London Bridge, meeting the Bishop of Winchester, William Waynflete, inside St Margaret’s. Cade and his men were staying just opposite at the White Hart Inn, a few doors up from the Tabard. The very catholic and originally Norman church of St Margarets was of course suppressed at the Reformation, and turned into a local compter prison. As the big church, St Mary’s Ovaries Priory, was renamed St Saviours and Bermondsey abbey was broken up too. The Tudor revolution had begun and Southwark was hit dramatically. But there was a valid reason for my false Eureka moment over “Mr Jonson’s book”, which at the time I thought might be a payment for a lost play by Ben Jonson himself, perhaps the missing “Isle of Dogges”, because of the date of 1598, or possibly “Every Man in his Humour”. Though there are no extant records for the Globe theatre, and Phillip Henslowe’s account books remain the prime source for the period and the theatres, it was not so absurd to assume, in the ad hoc nature of early impresarios and payments from the bag in local churches too, that Henslowe’s hand had got in here somehow. After all Henslowe was both vestryman and warden of St Saviours, which he lived right next door to at the Bell, for several years with his son-in-law the great actor Edward Alleyn. Whose name appears with Henslowe’s on The Great Enqueste in James’s reign, when a scandal developed at the church over abuse of money for the poor. The other reason is those ancient papers for St Margaret’s, St Saviours, and Cures College too, are all bunched together in those buff boxes in the London Metropolitan archive. Heart in mouth I turned to The Shakespeare Institute in Stratford and Professor Martin Wiggins, a Jonsonesque figure himself in his leathers and Doc Martins. Martin was encouraging at first, although it was tellingly the price of the payment, which I hadn’t written down properly, that raised the greatest question mark. He explained that plays of the period were worth £5 or £6, although Henslowe often gave advances of 20 shillings to writers, which is incidentally the same amount that was paid for Edmund Shakespeare’s funeral. True to any writer’s concern with money, fame and fortune though, as I sought for the book I was trying to write too, I rushed back to the archives only to discover that this payment for ‘Mr Jonson’s Book” was for a mere tuppence! On further eye-scrunching scrutiny of those often illegible papers, if on very good and thick Elizabethan paper, it turned out that this Mr Jonson was just a local scrivener, his little ‘book’ perhaps for copying something, or making an accounts book for the church, and my hopes were dashed. Yet never be disheartened too easily in the search for such a fascinating period. This goodly scrivener became another of the local figures coming back to life along the river, characters dimly discernible through the veil of financial records, like the Sexton paid at a time of obvious plague “for the burning of men’s bones”, or one “Widow Bradshawe”, one of the local beneficiaries of a place at that alms house, Cure’s College, whose name appears repeatedly. With the likes of Henslowe himself, Ned Alleyn and lost Edmund Shakespeare, they help build a fascinating sociological history of Southwark and theatreland, much about London’s poor too, among whom the players moved constantly. As fascinating as the characters in the Token Books or Vestry Minutes, in trouble with local Constables for refusing to buy Communion Tokens, at various times of heightened religious tensions, or marked down for the number of women moving in with them. Or as the foul mouthed watermen and taverners along the river, among the Stewes, or the sudden occurence of new professions in the marriage and christening records of St Saviours; like shipwrights or a ‘Hansom man’, one of the first moving ‘taxis’, joined with the arrival in Southwark of printers and publishers called ‘men in books’. An odd tale for a blog, in an age when millions of words are spewed out onto the web every day, and so losing so much value, meaning and power. But I am still convinced that was an age as revolutionary to the world of thought, because of printing, reform and theatres, as the internet or the closing of the London Stationers office only as recently as 2005 is to the now. For writers in the Sixteenth Century it was hard to survive, books and plays often supported by private donations. We seem to have returned to that time, in some ways, so please realise that the research on Edmund Shakespeare and Southwark represents two years of unpaid work. If you enjoy these blogs then and can afford to support Phoenix Ark Press, please donate below. Many thanks. 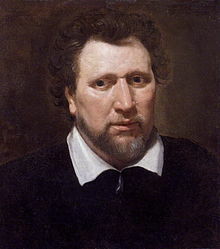 The image is taken from Wikipedia and is a portrait of Ben Jonson. Hi, David. I’m enjoying the Shakespeare blogs and can appreciate how much effort must go into the research. With that in mind, you have a lot of American fans and the donation system doesn’t appear to be over-the-pond friendly (it requires a county from a list, all of which are British or Irish). Any chance of getting this rectified? Hi Kelly, lovely to hear from you. Sorry, I didn’t quite understand that though, you mean you cannot donate (not that you should) via paypal or you mean that a Donation system isn’t popular in the US? From lack of Donations it ain’t popular here either, but no matter, the work and disemination are what matters. Hi there, I apologize for the confusion. What I mean is that the system seems to only take from accounts with pounds, not American dollars. It requires the donor to enter their county from a pulldown menu and all counties listed are English, Irish, Scottish, etc. I fiddled with it but there seems to be no way around. Regardless, glad you are enjoying the research. Thanks Kelly, I will check it. I don’t want you contributing anything though.